Height 5′ 3 1/2″ tall. What was it about the manner, character or history of Frederick Bevan that provoked the above statement by police constable Thomas? It is no small thing to believe a man to be capable of such a heinous crime. So what is known of Frederick Bevan? He received his Ticket of Leave on the 11th November 1869 and his Certificate of Freedom, in Bunbury, on the 23rd October 1871. Perhaps there was no opportunity to ply his trade in Western Australia for it appears he never returned to employment as a brass finisher. He was to be variously employed as a general servant, painter, cook and labourer. His name has been variously spelt as Bevan, Beaven & Beavan. “Beavan Walter died 30.9.1882 aged 4 years on Table Hill Station. The informant was F. Beavan, father Cooey Pooey (Could be Cooya Pooya). 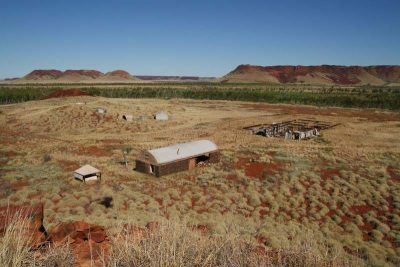 Located 35km South of Roebourne along the Harding River. Frederick Bevan laboured here in 1882. A stunning but harsh country that claimed the life of his young son. Used with the kind permission of Graeme “Ditto4”. Bevan’s arrest and subsequent trial for the murder of Thomas Anketell in 1885 is dealt with in great detail in other parts of this website and so I shall not repeat them here. From the preceding statement it could be inferred that Bevan was feeling a little cocky. Did he really believe all his troubles over? If he thought he was going to resume the life he had in Roebourne before his arrest for the murder of Thomas Anketell, he was mistaken. Despite the “not guilty” verdict, there were many people who thought otherwise. Bevan says himself in a later trial, which you can read further along, that he was “shunned and unable to earn a living”. On the 17th December 1887 The West Australian reported that Frederick Bevan had attempted to murder his wife. The case was dubbed “The Attempted Wife Murder”. Mary Ann Bevan survived her husband’s viscous attack. The evidence given during his trial makes us realise that she was an incredibly lucky woman to live through the ordeal. The description of the attack and injuries sustained is quite chilling to read and shows that Bevan was calculative and quite capable of a determined and bloody attack upon a defenceless person. His only defence was that he blamed his wife for provoking him, as can be seen in the following article. According to his Death Certificate, Frederick Bevan, occupation “shoemaker”, was aged 50 years when he died on the 13th March 1894 “near Koojan Midland Railway”. This is in the Victoria Plains district of Western Australia. The cause of death was shown as “Accidental. A heavy pole falling across his neck whilst asleep and suffocating him”. The informant of his death was Fred. G. Bewsher, Lance Corp. of Police, New Norcia. A search of The West Australian newspaper revealed the following account of his death. In the article Frederick is referred to as “Frank” Bevan. This may be a reporting error or Frederick may have used the name “Frank” to avoid being stigmatised over the murder case of Anketell and Burrup at Roebourne. Either way, it appears The West Australian was not aware of his identity, for that detail would surely have been mentioned. It is not known where Frederick Bevan is buried. The Shire of Moora kindly did a search for me including surrounding shires, but his name did not appear on any records. From this, I assume that he is in a lonely and probably unmarked grave in or around Koojan somewhere.